nvALT, my preferred text editor, has been the constant tool in my writing and note making setup for more than a year now. There have, however, been a few changes to both the way I write blog posts and the way I create and sync notes with my Android phone. Therefore, I felt a brief update was in order. While learning HTML syntax has helped me to build and customise this blog, it is not particularly easy to use when writing blog posts. What I prefer, is to write in plain text. To avoid writing out lots of HTML, I would write posts in nvALT and then add links, formatting and images in the WordPress browser-based editor. This was not the worst workflow but it was not ideal. Over the last three months I have been learning to write using Markdown. Markdown is both a software tool and a simple syntax, created by John Gruber, that allows you to maintain your focus on writing. It works by converting plain text, formatted with the Markdown syntax, in to valid HTML. nvALT has Markdown support built in meaning that I can write a blog post using the syntax, quickly open up a HTML preview to check that everything looks as it should, then simply copy/paste the HTML source code directly into the WordPress browser-based editor. After adding a title and tags all I have to do is hit publish. A far more pleasing workflow. A couple of months into learning Markdown I decided that I should find a text editor for my Android phone that supported it. Being a very specific search I quickly came across Epistle by Matteo Villa. Like nvALT, Epistle has built-in Markdown support. Which means I can write fully formatted blog posts on my phone, using the Markdown syntax. It has an elegant and minimal user interface. Note creation involves a single click and they can be organised alphabetically or by date. Also, you can select from serif, sans-serif and monospace fonts. 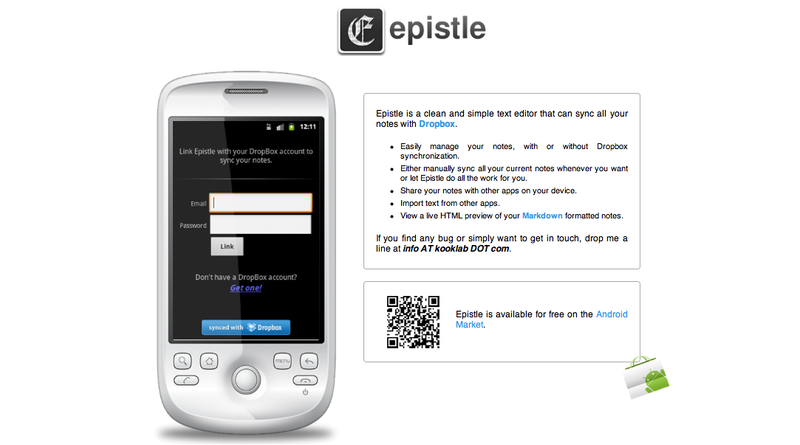 After a couple of clicks, I had Epistle working in exactly the same way as nvALT. I was completely sold. However, there was a problem. Epsitle does not sync with Simplenote. Instead it syncs with Dropbox. Fortunately, I remembered reading a blog post demonstrating how to sync your notes in nvALT with Dropbox and Plain Text for iPad. Re-reading the post it was clear that I could do the same with nvALT, Dropbox and Epistle. In short I switched to saving notes in nvALT as plain text files. Then I created a folder called “NV” and moved all my notes to this folder. Next, I synced the folder with Dropbox using MacDropAny. To complete the setup, in Epistle, I changed the Dropbox folder it was syncing with to the “NV” folder I had created. And that was it, my notes were synced across both devices. It’s almost a year since I first shared an insight into my note making and writing processes. In essence not much has changed. My setup and work flow remain perfect and ‘simple’; revamped but much the same. Very recently, Leo Babauta (he of zenhabits.net and mnmlist.com) published a post about his use of the free Mac application Notational Velocity. In the post he discusses how the app has become his number one writing tool. I also mentioned NV in a recent blog post and even though I have only been using it for a few weeks, I find myself using it far more than I expected to. I began by using the app to make notes and simple lists but have found myself drafting blog posts, letters and recording ideas that I can return to later. Therefore, I felt that I would offer some further refelections and explanation of why I like the application so much. Notational Velocity is one of the most uncomplicated and yet most powerful tools I have made use of. First and foremost it was the simplicity of NV’s design that grabbed my attention. The user interface boasts a clean writing space, free of the clutter you find in so many desktop text editors. There are no buttons as the app relies on simple search operators and a series of built in shortcuts (not an extensive list) to operate. At the top of the app is the location bar (which you can return to at any time by clicking cmd-L) – here you add new notes (type a title and hit return) and/or search for and within notes. ‘Search’ functions much like Google instant, sifting through your notes, revealing the results as you type. Below the location bar is your list of notes, sortable by ‘title’ or ‘date added’. And below this is the note body, an open space, ready to be filled with text and nothing else. I, like Leo, have expanded this area to make it more useful for writing. Beneath the simplicity of the UI are some very straight forward but useful inner workings. 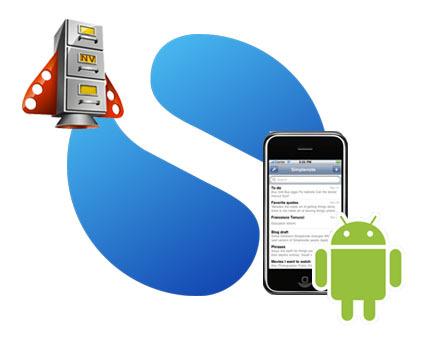 By entering your Simplenote username and password, notes are synced to your Simplenote account. It’s free and updates regularly. Also, built into the app is an auto-save function meaning you never have to worry about losing what you have written – I have mine set to sync every minute as I write at quite a rapid pace. Finally, you can (if you wish) tweak features like the typeface and font size. However, I was more than happy to stick with the defaults when after starting up the app for the first time I was overjoyed to be greeted by Helvetica, size 12. Woven within the simple exterior and inner workings of the app, NV holds immense power: the power to free you from distractions, allowing you to focus on your writing. As I’ve already mentioned my original intentions were to simply use NV to keep lists and notes that I could mail to myself or expand upon in Google docs. However, the app has become far more than a simple note making tool. I am using it to write almost everything – at least in the early draft stages. Why? Becuase the simplicity of the UI allows me to focus on the content of my writing. Having resized the app from its default setting I have created a focussed space for me and my thoughts. It is lovely to get my ideas down, free of the tools and buttons used to tinker with font size or to insert images. My time and attention remain firmly focussed on the task at hand: writing. And that’s the thing, I really have started using NV for everything. I feel liberated, free of distraction, free to focus on my writing. Added to which I have become even more productive, writing everything from within one space – no switching between apps for different tasks. I do it all here, only moving to Word or Google docs when there is a need for formatting or the addition of other media. Those (for me at least) are the after thoughts; the window dressing – it’s the words that do the talking! In a world dominated by tools and products that allow you to do multiple things at once, Notational Velocity is a reminder that sometimes simple is best. Posted on Monday, 20 September 2010 Categories Design, Productivity, TechnologyTags apps, blogging, design, focus, leo babauta, minimal, notational velocity, notes, productivity, simplenote, simplicity, Technology, writingLeave a comment on Notational Velocity – Freedom To Write! I’m always looking for ways to improve my productivity. Having been an early adopter of both Google Calendar and Google Tasks, I have felt for some time, that there was a link in the chain missing. While both apps have the ability to serve as a place to write and store simple lists, I don’t feel that their UI’s lend themselves to this function very well. For me, Google Calendar and Google Tasks are about events that are in the future: days, weeks and months away. Between them I schedule meetings, presentations, important tasks and events; input key dates from the school calendar such as parents evenings; and perosnal events like dentist appointments and birthdays. What I wanted, was a tool in which I could keep and access my day-to-day ‘to do list’. Stuff like email Leah’s parents to say how well she is doing or finish marking my Year Tens’ writing assessments. And I wanted it to allow me to record random thoughts, blog ideas; to keep a list of books I wish to read; and to take notes quickly and efficiently in meetings. What would be even better if these notes could be synced in the cloud and I could access them on or offline wherever I was. Que: Simplenote; Simplenote for iPhone; mNote for Android; and Notational Velocity. These four tools/apps have provided me with the perfect ‘simple’ note making process that I have been searching for. These apps working in tandem truly represent what mobile sync was created for and the integration is seamless. Here is a break down of how this set up works (for me). Simplenote – To get started you need to create an account. Like many apps and tools today this process is simple and efficient. Signing up allows the magic to happen providing the cloud based storage and syncing functionality for your notes. 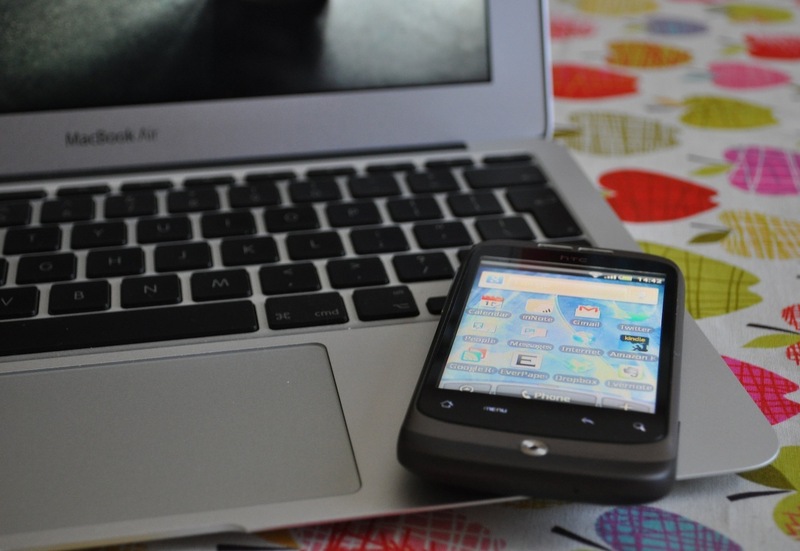 If you’r connected to the internet, got a wifi connection or are on 3G your notes will sync so no matter where you are or what device you have at hand you can check, add to, edit and delete your notes. Once you are signed up, you can move straight on to downloading the iPhone app. iPhone – (iPod touch in my case) – The app is as quick to download as it is to sign up for the account. Once installed you are greeted by a series of helpful notes that are waiting to help you make the best use of Simplenote. The UI is clean; adding notes is a synch and while you are connected to wifi/3G your notes will sync frequently. Therefore there are almost no buttons to be clicked including no save button – it is simply not needed. Once you have added your account info you are away. I think that the native app has the most pleasing UI and most seamless functionality so I make use of it around the house, giving my HTC Wildfire a rest. mNote – I also needed to be able to make and access my notes while at work and with no native app for Android I searched the Market and found mNote. It was as quick and easy to install as the iPhone app and while it is a little rough around the edges in the UI department, it certainly makes up for it in ease of use. The white on black interface displays well on my HTC Wildfire’screen and has become one of my most used apps after returning to school this past week. I have used it in numerous meetings and even recorded thoughts and ideas on the fly during lessons as they have occurred to me. Notational Velocity – The final piece of the puzzle was to find a desktop app that I could use to access my notes while I was at my school desk or working at home. This would allow for copy/paste functionality and for me to continue to be able to make notes whenever they occurred. Notational Velocity offers an extremely lite client with a great UI (a common theme amongst Simplenote apps!) and boasts an impressive list of keyboard shortcuts (included as a pre-installed note) making it very easy to use. I have already used it for taking notes in longer meetings and even wrote the first draft of this post with it. Like Google Calendar and Google Tasks before it, Simplenote has quickly become a staple of my day-to-day routine. What do these tools have in common? Great UIs; cloud based sync across multiple devices; and ease of use. A winning combination every time!